Seventy employees from BioMarin gathered together at their headquarters north of San Francisco, California for a Build-a-Bike ® team building event. The employees were from BioMarin’s quality control department which has seen tremendous growth in the past year. Another group from BioMarin participated in a Build a Bike team building event a year ago and the organizer’s of the quality control team were eager for their team to participate as well. They were specifically looking for them to go outside of their comfort zones, to interact with everyone on their teams as well as to go outside their current circles. The employees consisted of entry level positions all the way to senior managers and they were excited to see what their other colleagues had experienced the year prior. To accomplish the goals of the event the individuals need to bring their unique talents and strengths to find the most effective solutions. While some of the participants were very comfortable working with each other, others did not know each other at all or very little. With the employees that already know each other there can be ingrained patterns that may not be the most effective ways to communicate. With the ones that do not know each other a level of trust has to be achieved. Either way, a whole new level of communication was established that the group will be able to take with them far beyond the Build a Bike. They came together quickly and worked diligently to complete the challenges of the Build a Bike team building event. Not only did they come together as a team, they also gave back to the community through the event. 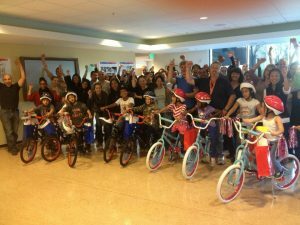 Being from the quality control department the bikes were built impeccably and the seventy employees presented ten bicycles to some very lucky kids at the Novato Youth Center. The Build a Bike team building event gave the BioMarin employees the opportunity to see a direct result from their work and generosity and the kids will certainly remember that day for a long time to come as well. Thank you to BioMarin again for hosting a fantastic Build-a-Bike ® team building event!